Our first order of business this morning is to review the performance of the options contracts we signaled for observation in yesterday’s premarket report, We specified our interest in trading GPRO Weekly $31-32.50 Calls, and the FB Weekly $90-91 Calls, and every single set of contracts we tracked provided the opportunity for impressive profits before lunchtime! Later in the afternoon, the markets dipped back considerably and continued to backslide into the close. This morning, we’re seeing a substantial gap-up on the heels of jobs numbers, leading us to believe that similar action could transpire during today’s session with regard to an early surge. In that case, anyone who may have shown up late to the party and held contracts overnight, should be on the lookout for the opportunity to take profits early on. Those who are just arriving, should be waiting for the dip caused by those profit-takers to ride the subsequent rebound. We’re going to highlight VAPE this morning as a bottom-bouncer that spent the better part of the summer on an overall downtrend, and has just begun to trend up off of the new annual low it established on Monday. Taking a further look at the chart we get the sense that a more protracted recovery could take place, so we’ll pin this one to our tracking list in the days ahead. 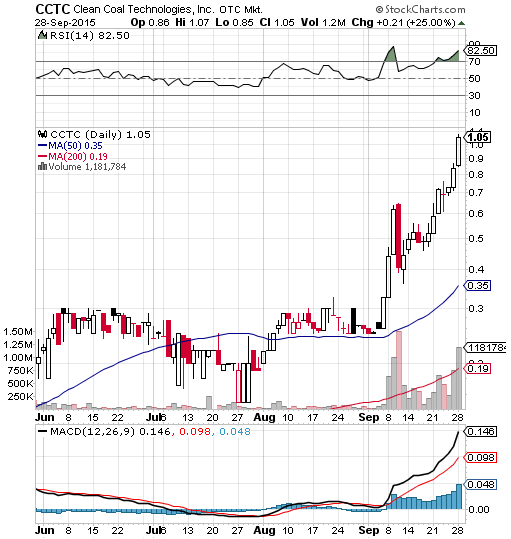 No sooner than we were commenting on CCTC’s fantastic performance in the month of September in yesterday’s morning report, did the stock continue to bull its way to new highs. As is plain to see on the included chart snapshot, it has mostly been one positive session after another. The chart is now well into overbought territory, so we wouldn’t be surprised to see a bit of a pullback. In order for us to remain interested in CCTC, we’ll need to see it maintain support in the channel between .75-.65, at the lowest. A quick tag search for BLDP on our blog shows our long history with this stock, and we wanted to quickly re-mention it this morning. We most recently tagged it as a bottom-watch play on July 2nd after noticing the stock taking a big backslide. It has been mostly in a downtrend since that time, but we’re going to want to begin watching more intently. We’ll continue to keep BLDP on our extended-term recovery watchlist. After five straight days of down markets, we’re going to be on the lookout for a rebound today. We’re seeing a gap-up here in early trading, so we wanted to venture a couple of options ideas if events play out as we expect. We’re going to zero in on GoPro, Inc. GPRO and Facebook, Inc. FB for potential opportunities, specifically the GPRO Weekly $31-32.50 Calls, and the FB Weekly $90-91 Calls. Our closing thoughts in Friday’s premarket report included some options ideas pertaining to our bullish feelings on AAPL and the SPY. Specifically, we targeted SPY Weekly $193-194.50 Calls, and AAPL Weekly $115 and $116 Calls and included the following warning: “Trading options with a weekly expiration on a Friday carries an inherently elevated risk-reward factor, and is certainly not for the faint-of-heart, or beginning traders.” That would have been an important thing to remember, because the markets did pull back toward the end of the day, eventually rendering those contracts worthless, but not before opportunities for some big intraday gains were presented. Early trading ranges in our SPY Calls rendered the chance at gains between 70-130% while the AAPL Calls did considerably better. The $115′s made a 293% move from .27-1.06, and the $116′s took the cake with a 520% surge from a nickel up to .31! We also had some successful ideas going in the opposite direction; our bearish sentiment on HRTX paid some excellent dividends via the options chain last week, as we were mentioning on Friday. The stock continued to backslide into the close, reaching the $30-range with a daily low of 30.06. From our observed high of 42.25 at the time of our initial alert last Wednesday that’s roughly a 30% loss. It will be interesting to see if this morning’s PR from HRTX affects the dynamics of the chart. We also want to make another quick mention of CCTC, which has continually set new highs for us in the month of September. We tracked the stock to some more nice gains last week, as it made a healthy intraday move of 21% from .72 to .87. That extends the total range we’ve observed following our initial alerts earlier this month from a low of .36 to Friday’s high; a total move of 142% in just two weeks’ time. We tagged this old familiar play on Friday for the first time since spring, and it turned out to be fortuitous timing as the stock made a noteworthy intraday jump. THCZ traded from a low of .09 up as high as .1189, a 32% spike. We’ll begin to pay closer attention to this and other cannabis-related stocks as election time draws nearer and the issue of marijuana is once again tested on ballots. We’ll be open to the possibility of new waves of attention for the sector as a whole, and be sure to keep our ear to the tracks for relevant developments. A failure to beat Wall Street’s expectations on both guidance and earnings led PIR to gap down on Friday, though the dip wasn’t sustained. After seeing a low of 6.84 the stock did manage to recover quite a bit of ground into a 7.61 close. 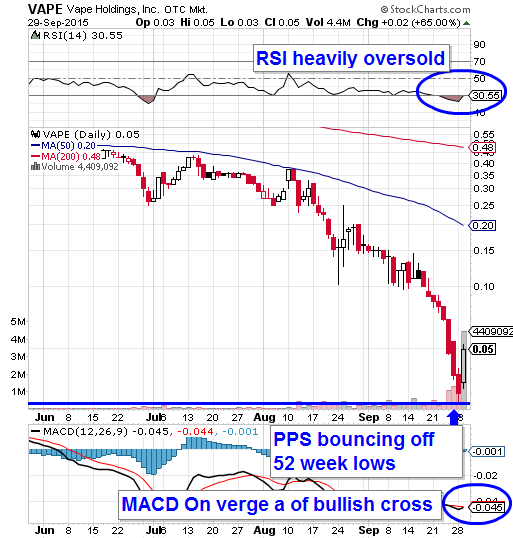 This transpired at a time when the chart was already fairly oversold, and that effect has been magnified as we point out on the chart snapshot below. 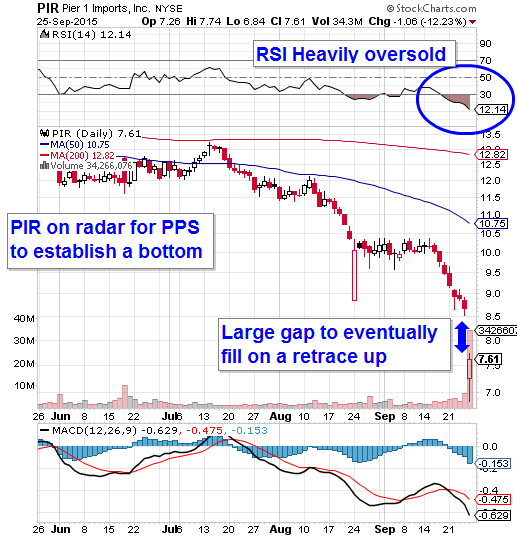 We’re going to have PIR on an extended-term recovery watch. A return to even the 50DMA would spell significant gains from the current juncture. During premarket trading on Wednesday, we spotted a unique opportunity in HRTX, which was in the process of surging on news of some positive Phase II study results. We pointed out that despite the excitement and subsequent knee-jerk reaction tied to the announcement, the chart had been looking bearish and “ripe for further losses” leading up to that point. That’s what caused us to formulate an idea for the HRTX Weekly $45 and $42.50 Puts for when the stock began to pull back off of its hype-driven spike, and the ensuing chain of events followed our expectations to the letter. BRWC was a mention in yesterday’s morning report, and the stock made a noteworthy intraday spike of 33% from a low of .0009 to .0012. 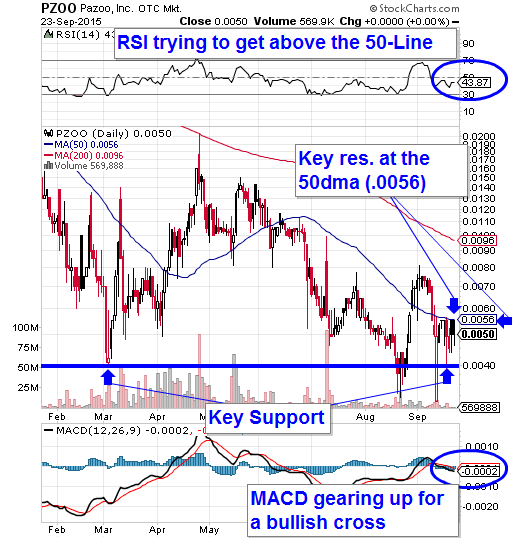 From the look of the chart, for us to remain interested, we’d need BRWC to maintain support above the current 50DMA of .0008 on any pullbacks and test its previous swing high of .0013. Beyond that point, there isn’t much in the way of resistance on up to the .0018-level. We’re looking at SIEN as a potential recovery-play after news of a securities fraud investigation absolutely pushed the stock off of a cliff from the $20-level down to a new 52-week low at 9.38 yesterday. Even with the caveat of a pending investigation, we’re always looking at the possibility of snapping up highly-discounted shares when a stock tumbles so dramatically on events where no material changes in the company have taken place. Already in the premarket we’re seeing a bit of a course-correction from SIEN as it has made its way back to the $11-mark. We’ll keep a continuous eye on this stock in coming sessions for the possibility of a rebound, and keep a lookout for any further updates regarding the accusations levied against Sientra. After taking a beating for the majority of the week leading into a late-day rally yesterday, the overall markets as a whole are gapping up early this morning, and we’d like to float a set of corresponding options ideas if the trend carries the way we suspect it might. We’re going to be looking for some dip-and-rip action, and in doing so, have our sights focused on Weekly Calls* in both the SPY and AAPL chains. In particular, we’re zeroing in on SPY Weekly $193-194.50 Calls, and AAPL Weekly $115 and $116 Calls. *Just to reiterate what we’ve said in the past- trading options with a weekly expiration on a Friday carries an inherently elevated risk-reward factor, and is certainly not for the faint-of-heart, or beginning traders. We come back to touch base with PZOO this morning as the company has released an update on its marijuana testing facility in Las Vegas. It’s significant in that PZOO has secured a loan for the capital to put the finishing touches on the laboratory, the terms of which state that the full amount will be paid from the proceeds of the lab itself. The company also made some lofty claims, namely that it has such an impressive roster of clients-in-waiting, that when the labs do open, they will be in a position to break even in the first month of operation! We’re being told that this cash infusion will have things on track for a November grand opening, so we’re going to begin to monitor PZOO more heavily in the weeks ahead as more updates are sure to be forthcoming. WHIPPANY, N.J., Sept. 24, 2015 /PRNewswire/ — Pazoo, Inc. (OTC: PZOO) is pleased to report that Pazoo has received a $200,000 Loan to be paid back from the revenue and earnings of the Las Vegas Facility. There can be no debt to equity conversion as this is a more conventional form of financing. The Note holder was so impressed by the Las Vegas Lab, and more so by the amount of growers that have committed to exclusively test with Pazoo, Inc subsidiary MA & Associates, LLC, that he was comfortable to be paid back from the revenue and earnings that will be generated from the Lab. In fact, based on the commitments from growers, Pazoo management is confident that the lab will be at least break even within the first 30 days of operation, and will quickly transition to profitability. Pazoo expects to have the Colorado testing facility to officially be under the control of Harris Lee Colorado, LLC on or about October 14 and have the Las Vegas Facility operational and testing product in the latter part of the 4th quarter.